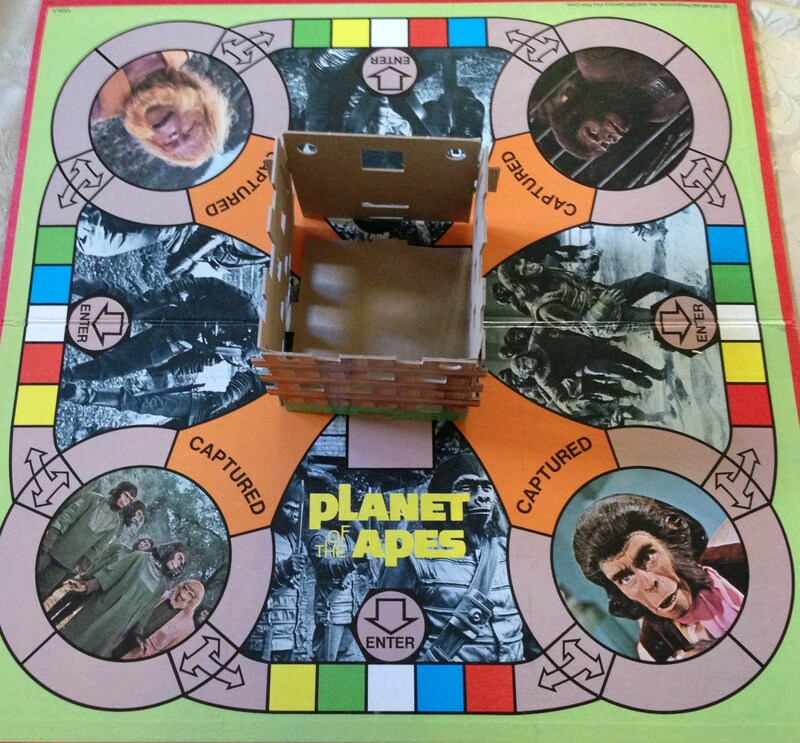 Because my husband’s birthday is approaching, I’ve chosen The Planet of the Apes Game for this week’s installment of my vintage board game series. My husband loves The Planet of the Apes and all its sequels. I, on the other hand, have always had an aversion to monkey-and-ape-based entertainment. I may have inherited this from my grandmother, who cringed whenever a chimp appeared on a TV sitcom (an all-too-common occurrence in the ’70s), or I may have developed it after a series of gorilla-related nightmares at age 3 (a Playskool Zoo started it all, but that’s a blog entry for another day). Through marriage to an ape fan, I’ve managed to overcome my prejudices–at least to the extent of buying him ape memorabilia like this. Game Box: Pretty appealing to a Planet of the Apes fan, I suppose. All the major apes are represented. I’m not sure why Dr. Zaius is in black and white when everyone else is in color. Recommend Ages: 8 to 14. 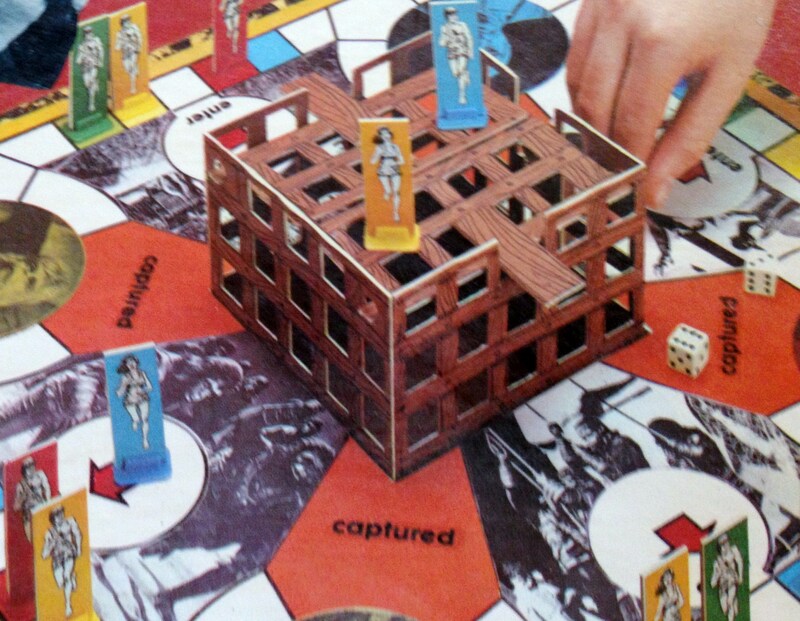 Game Board: Simple, with lots of photos from the movie. The unique part is the cage that stands in the center. 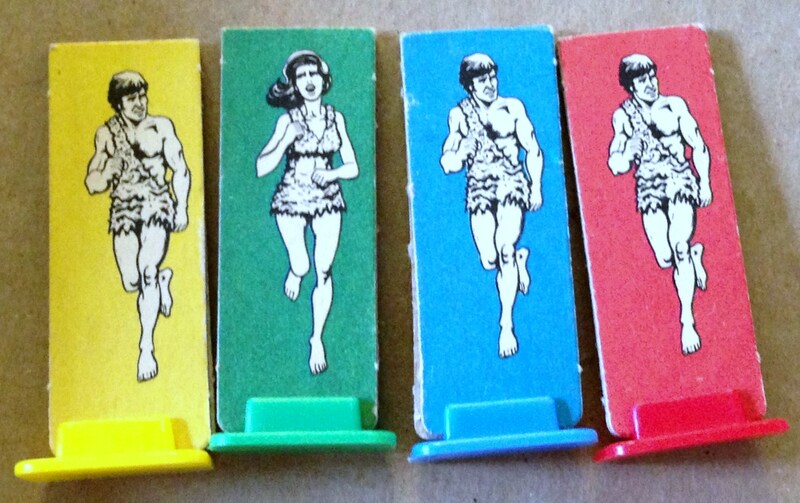 Game Pieces: Generic-looking male and female humans. At least we get front and back views. Game Play: Each player gets four humans. You move them along the path until they land on a “Captured” space. Then you have to place your human atop the cage and let your opponent turn the cage’s knob. If the human falls in, he or she is captured. If not, they’re safe—for the moment. Cage Fail: My cage is missing some key parts, so it doesn’t function. You can see how should work from this box closeup. Object: “Become the last survivor.” Very cool object, my opinion. My husband kind of over-identifies with the movie’s apes, though. I think he’d rather see all his humans caged. Today’s Bonus Feature: With my own stance on apes softening, I’ve developed an affinity for ape-themed old-time radio episodes. At least in those, you don’t have to see the apes. Sometime in November, I plan to post a whole playlist of ape episodes, but for now please enjoy this delightful example. Murder at Midnight has become a guilty pleasure of mine. It’s cheesy, but in a very entertaining way. This episode had me smiling all the way through. 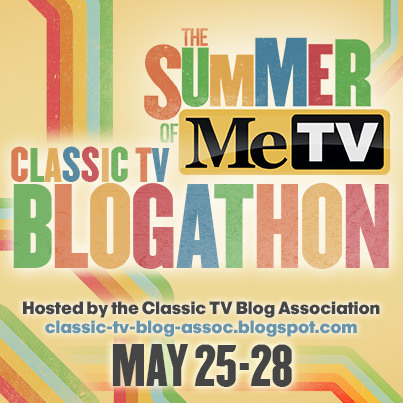 This entry was posted in Collectibles, Movies, Radio, Spin Again Sunday, Toys and tagged 1970s, Board Games, Games, Movie Memorabilia, Nostalgia, Old-Time Radio, Planet of the Apes, Retro, Vintage. I somehow managed to avoid seeing the movies until I met my husband. They’ve kind of grown on me. I let my husband name our first cat Cornelius!